‘Tis the season to be unbelievably busy and my attention span for reading is like that of a fruit bat in an apple orchard. I’m swooping from one thing to the next, discarded books in my wake (first 20 pages of The Finkler Question, opening paragraph of C, first half of a Phillip Kerr) and a strong sense of dissatisfaction. It’s a bit like being faced down by a plate of Christmas cookies: everything looks delicious but nothing I eat can placate my appetite. My history with German books is not good. I have read the first couple of pages of Der Vorleser and the first chapter of a Charlotte Link novel, but I gave up through sheer laziness. Reading in German is work and I like my reading to be pleasurable. However, when a book comes with L’s strong recommendation – it being one she selected and bought with her pocket money and during the reading of which she made happy noises – I had to give it a go. Luckily, Als die Steine noch Vögel waren is a slender book, coming in at 122 pages. Marjaleena Lembcke tells the story of growing up in Finland, as one of seven children in a household that struggled to make ends meet. One of the children is Pekka, who loves everything: his bed, the moon, the smell of his mother and all the birds of the world. Pekka believes that all stones were once birds and could one day fly again so he spends much of his time throwing them, hoping to encourage them to fly once more. Pekka was born mentally and physically disabled and spent the first two years of his life in hospital, having multiple operations. When he finally joins his family, he has to learn how to walk and speak. When he does, however, the family find a joyous soul bursting with love. Pekka’s joy infects his family and sister’s story. He views the world differently and his alternative philosophy helps the family keep their spirits up when money is tight and Father considers emigrating to Canada. He is also a survivor, who emerges unscathed from a choking incident, being knocked out several times and having a bout of leukamia, which turns out to be wrongly diagnosed anaemia. This is a lovely, gentle, sweetly written book which I enjoyed immensely. It was a light and satisfying read and a perfect antidote to my reading troubles. A cucumber soup, perhaps, to those heavy and overly sweet Christmas confections. So, I’ve read a whole novel in German! And in October, I read my first e-book. I have yet to devise an e-book strategy, but I thought for my first experience, I had better select a page-turner to ensure that I actually read the thing. I choose Belinda Bauer’s Blacklands, a much-acclaimed crime debut, and while it was a great read, I now feel a sense of sadness that I don’t own the physical book. I feel cheated. Despite the instant gratification of selecting an e-book and downloading it on the spot, at the moment I have no great desire to read another one. I have friends who travel frequently and download books for their journeys, and I can see the logic and convenience in that, but right now my life doesn’t require huge travel (though I live in hope). Some of my Litopia pals have published e-books and I plan to read them over the holidays, but let’s just say that for now, I’m not convinced. Do you have an e-book reading strategy? Are there books you need to see on your bookshelves and others you are happy to have as digital copies only? Categories: Books, Christmas, E-books, Reading | Permalink. Wishing you and yours a wonderful festive season. May your drinks be deep, snacks be crisp and tempers be even. 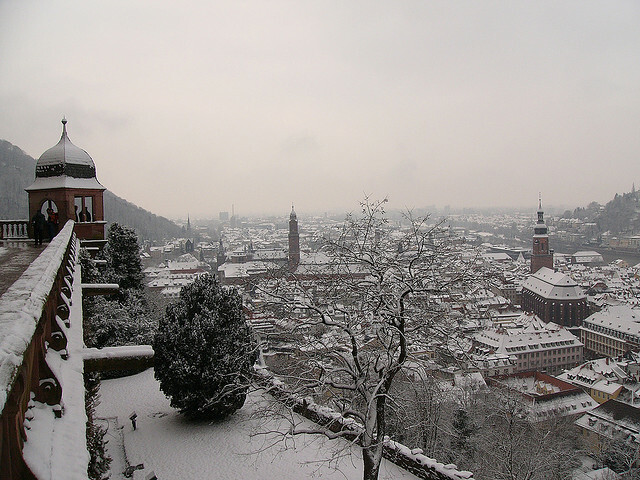 Categories: Christmas, Snow | Permalink. Sometimes, I am impossibly cool. If Christmas doesn’t end soon, I’m climbing that statue. Categories: Age, Being a Grown-Up, Birthday parties, Birthdays, Christmas, Concerts, Dancing, Live music, Turning 40 | Permalink. I’m going to take a little blogging break while I enjoy Christmas with my family. The Forest Maker has arrived, after some airport complications, and I am loving spending time with him. I am reading, making stuff with my kids, wrapping presents, planning desserts for various parties, sipping red wine in the evenings with my husband, watching DVDs and relaxing. 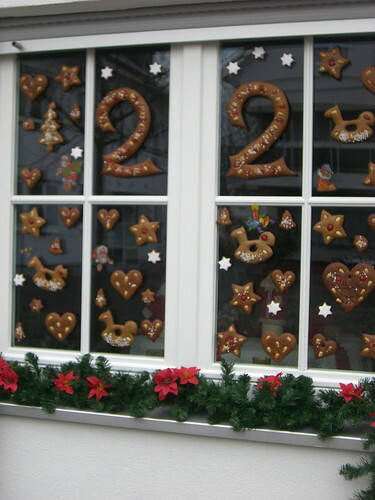 Categories: Christmas | Tags: Christmas in Germany, decorations, Gingerbread, Lebkuchen | Permalink. Has anyone else noticed how much fun Christmas is for the children? They’re the ones getting stockings filled with treats, presents under the Christmas tree, and, if they live in Germany, daily mini-treats in their Advent calendars. Children get to decorate the gingerbread men, decorate and eat the Christmas cookies and in our house, they even get to decorate the tree. The grown-ups don’t get a look-in. Here’s a German muffin recipe to console the grown-ups and bring them a little Christmas cheer. It contains amaretto and dark chocolate and is not for children, unless they have very sophisticated palates. Prepare a muffin tray with 12 muffin cases. Pour yourself a generous glass of red wine and commence sipping. Sift the flour, baking powder, salt. Have another large sip of red wine. Beat the eggs with the vanilla extract, sugar and amaretto till it’s creamy. Slowly beat in the softened butter. Taste again, to ensure it’s adequately alcoholic. If not, add more amaretto. Mix in the chocolate shavings. Eat the leftover 40g of chocolate. Fill each muffin case two-thirds full. While you wait, eat any remaining muffin dough and sip your red wine. If necessary, pour yourself a second glass. Remove the muffins from the oven. Allow to cool (about a minute will do) and then eat with your red wine. I had one for breakfast this morning with coffee. I think I have a hangover. * Apologies for the metric measures. Categories: Beauty, Being a Grown-Up, Chocolate, Christmas, Indulgence | Tags: amaretto, christmas muffins, dark chocolate, German recipes | Permalink.